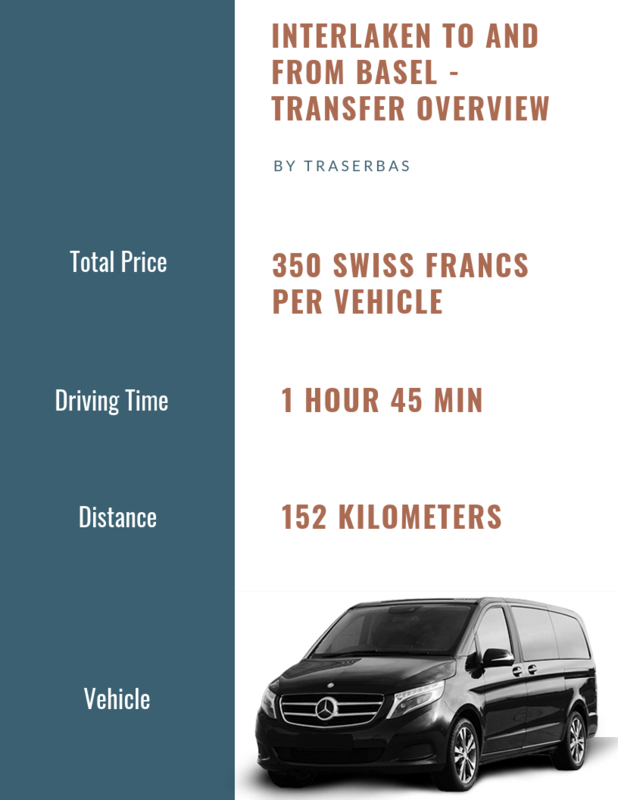 Interlaken to or from Basel transfer with Traserbas is the most comfortable way to travel between this two cities. The driving time by car is 1 hour and 45 minutes for the distance of 152 kilometers. Traserbas offers private transportation from Interlaken to Basel and of course from Basel to Interlaken for the same rate. You can decide if you want to travel by train or by private Basel car service with a limo, sedan, van/ minivan or minibus, we offer with our Basel car service a point to point transfer, that means we pick you up wherever you want and drop you off at any desired location from one city to the other city, that can be the airport, train station, hotel, apartment or simply any other location. For Interlaken to Basel or Basel to Interlaken you can add also 1, 2 or more hours for sights along the way, for this offer scroll below to sights along the way. How can i book a private transfer Interlaken to or from Basel? You can book your private transfer between Interlaken and Basel using our booking page, via phone or email. How can i pay my private transfer from Interlaken to Basel or vice versa? You can pay your private transfer with cash (Swiss francs or Euros) or by credit card directly to the driver. We are more than 2 people, do you have larger vehicles? We have vehicles for up to 7 people and space for each big suitcase and each one carry on bag. If you cancel 24hrs before pick up you don`t have to pay any cancellation fees. After 24hrs that means within the 24hrs we charge 50& of our offered and confirmed rate. Doesn`t matter when you need the pick up, we have 24 open and our drivers pick up our guests around the clock. You can book your private transfer from Interlaken to Basel or from Basel to Interlaken easily via phone, email or our booking page. If you need assistance than give us a call to help you with your questions, we will be happy to hear from you. Do you know your pick up and drop off location than go to our booking page and book now your transfer. After the booking you will receive a booking confirmation and if you need to change your pick up or drop off location, the pick up time or date you can send us a email and we will change it without extra costs. Just e thing aout the sights along the way, if you want to add this offer please write it in the field additional details and thats all. You can add to see sights along the way with Traserbas for transfers from Basel to Interlaken or from Interlaken to Basel. You can decide what you want to see and how long do you need the additional time. This offer is much economical than to book a private tour with your personal tour guide, years ago we offered also tours with personal guides but this option was not really economical because for most of the information you don`t need really a guide because all this informations you can find with a few clicks in the web and a private tour guide is additional money which you have to spend. We decided to offer car and driver hire in Switzerland services at affordable rates, the most comfortable and most economical way for private day trips or sights along the way.